A week had passed since my last visit to the syndicate trout stream, once again only having the time for a couple of hours on the fishery. The rains had been light in previous days, reflected by the clear chalk stream running at normal pace and a mayfly alighting on my hand as I pulled on my waders, mean’t that the trout would still be ready to rise to the artificial. From the road bridge I walked up toward the first pool seeing that the mayfly were passing by unmolested and thought that maybe the fun was over for another year, the trout having grown fat on these winged beauties, were finally sick of them. A ripple coming from beneath a bush said otherwise, getting down into the river and worked my way up into a position that gave clearance for a back cast. Trying a few casts into open water to get the distance, I waited for another rise, a mayfly being gently sucked beneath the surface suggesting a small fish, possibly a chub. 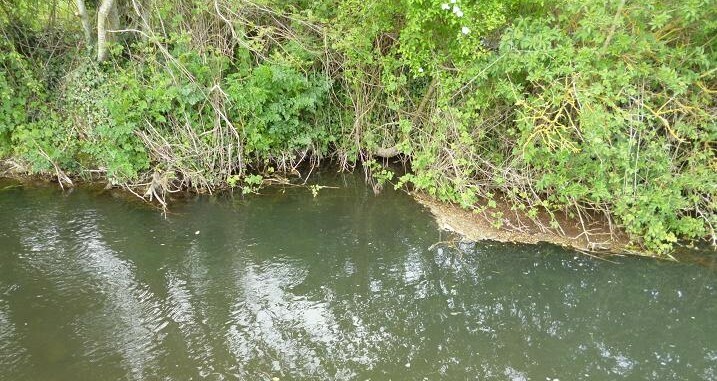 Another rise confirmed it was lying close to the bank protected by an overhanging branch and third cast the Mayfly dropped into the pocket above it. Drifting next to the branch, the fly disappeared in a casual swirl, that exploded as the hook took hold. The 2 lb cartwheeling trout took me by surprise, far stronger than I expected, it raced deep into the pool taking line, then turned back to the shallows, skimming from side to side, before diving back into the depths. One second it was in my net, then it was out again leaving only stones from the riverbed. Following it into the pool allowed me to finally get the net under a fat trout. What a lump. There has been a steady hatch of mayfly this month and this stockie has taken full advantage of the extra protein. The artificial was sodden, but still in good shape despite the struggle and a wash in the river, followed by rub in with floatant soon had it ready for action. 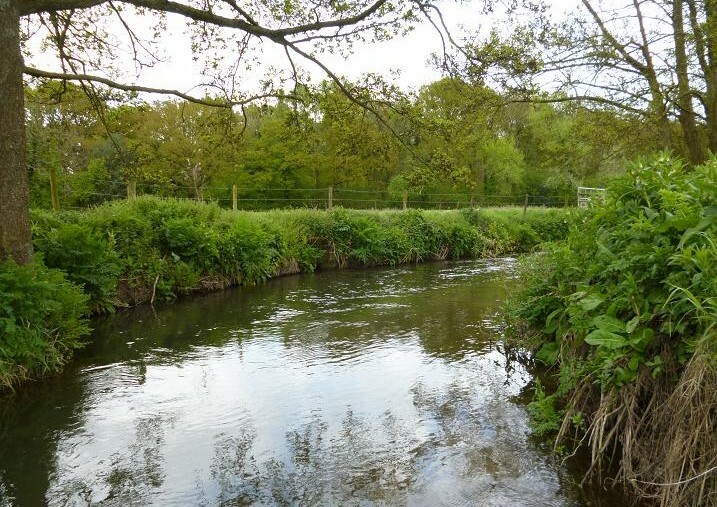 Short on time, I decided to trek across the fields to reach a spot, where last week, four fish had been feeding on a deep bend, only to find another syndicate member in the river complaining of a lost fish. After swapping fishing stories, I continued upstream toward another favourite pool, but stopped short, when a fish rose close to the bank ahead of me. Retracing my steps, I slid down into the river again, keeping my eye on the rises. With a high bank and an overhanging tree, it was not an easy cast, but closing the gap allowed an angled cast that put the fly in the perfect spot for an interception. Plop! The fish took and I was soon playing a smaller, but equally plump brownie, that was promptly netted. Released without the need for recovery it swam off, leaving me unable to climb back out, due to the steep bankside. Wading round the bend another fish rose in a riffle, then stood on it’s tail to chase an escaping mayfly. Once again shielded by trees, this was another difficult cast, but within a few yards of the rough water, several flick casts were needed to put the fly above the feeding trout. Darting from cover it hooked itself, lifting the rod bringing the 12 oz wildie tumbling back toward me and to my feet. The big red spots of its flanks flashed as the brownie spun round and came off. A picture would have been nice, but maybe next time. At this point I was able to climb out of the river again, just managing to crawl under the electrified fence without a buzz. The farmer does not make it easy for us fishermen. From a hundred yards away, I saw a rise at the mouth of a wooded pool and walked up the left bank before getting back into the river. In that time the fish had not risen again, but waded up to be as close as possible. This a hard fished pool and decided to make long casts into the area. As the fly drifted back a fish nosed and sank it. A couple of false casts dried it and a shorter drop put it on the top of the rise. A swirl and a miss. Dace? Next cast a lightning strike answered my question and a small dace launched skyward, then dropped off. The larger fish rose again in the left hand corner as I rubbed in more floatant, then a noisy boil. A long cast dropped at the base of the left hand tree, the deep water creating little flow and drift of the fly. Splosh! I was in again, the trout running deep into the pool, before turning to run down the deep channel on my left, fighting below me for a second, then powering back up. About a pound, the game was soon up for this trout and with its head out of the water, the net was waiting. The fly was well down inside the jaws of this deep sided brown trout, the forceps pushing the barbless hook free. Three fish landed and one lost in under two hours was good enough for me and I headed back. By next week the mayfly hatch will be over for another year and each trout will hard earned from then on. Working in the garden between downpours had earned me a two hour fishing pass from my wife and I headed off toward the syndicate trout stream, hoping to find the mayfly in full hatch mode. Strewn around my kitchen were various fishing jackets drying over chairs, retrieved from the washing line too late to save them from another soaking. An old moth eaten gardening jacket had been pressed into service, pockets filled with a few essential accessories, along with the all important box of mayflies, before setting off, but whether it was still shower proof was soon to be tested. Crossing the river in the van, the road was still running with water, but once parked up the worst of the shower was past. The sun was out and somewhere there would be a radiant rainbow, but with chest waders to wriggle into my mind was on the mayfly. Joining the river at the bridge, the jacket was doing an acceptable job of warding off the rain and I made my way upstream under the trees to where a feeder stream comes in, seeing that it was carrying at least 6 inches more flow, the gravel run on the main river, now a speeding glide. No mayfly were visible and and certainly no fish rising. Carrying on upstream, gulls were sweeping low over the river at what I guessed were mayfly awakened by the sunshine, but the trout were not taking. With no time to waste, I pushed on until rounding a bend the tell tale ring of a rising fish was spreading across the surface. Here mayfly were landing and taking off, being harassed by at least two trout, getting down into the river well below to wade up toward them. The wind was sweeping in gusts across the river making long casts difficult, the only option was to keep low and cast a short line. Yesterday’s successful Bodied Mayfly was routinely ignored, while the real thing were slurped down with abandon. 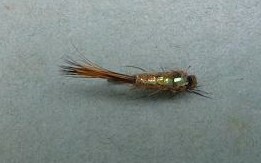 My next choice was also snubbed, and plumbed for a traditional Winged Mayfly. The trout at the head of the pool broached a couple of times as if determined not to let any mayfly pass to the fish below. It was a broad fish and I edged closer to present the fly, the wind controlling the last foot of descent. Close to the bank it took, leaping clear when it felt the hook, then rushing upstream to the bend. Without giving line, I let the rod take the strain, walking five yards down to where I had left my landing net in the reeds, the trout swimming straight out again at my first attempt, regaining strength for another run. This 16 inch stockie full of high protein mayfly needed no reviving, swimming off upstream the moment it was released. The fly was a bit bedraggled after the fight, but squeezing floatant grease into the wings and body, followed by a few false casts, had it ready for action again. There were now rises further up round the bend and I waded up spooking the other trout, that bow-waved into the upper pool. The fly dropped to the surface, drifted a foot, then disappeared with a wallop as it was engulfed by another good trout, that powered away round the bend. Keeping the rod high, I waded after the trout, leaving the landing net again, my hands too full to carry it. The line went solid and I rounded the bend to find the fly lodged in a clump of reeds. To get the fly back meant wading through the middle of the pool, so that was the end of that little pocket of feeding trout. Time was now marching on, I’d been rewarded with some fish, but now it was time to go and I headed back to the van, stopping at the feeder stream to see a trout rising mid river in what would normally be an couple of inches of water over the gravel. Wading out to it, I kept the line tight again due to overhead trees. He was missing many of the mayfly probably due to the shallow water reducing it’s cone of vision, but for me it took after half a dozen offers for the take and I was soon playing a very silver wild brown trout. The colouring of this trout is unique as far I am concerned, the pound fish an added bonus on such a brief visit. A week after my last outing on the syndicate river, saw me checking the forecast and waiting for a prolonged downpour to finish before heading west into the promised three hours of sunshine. The black clouds were in retreat when I arrived, although the hoped for mayfly were absent. After a week of showers I had expected the river to be heavily coloured, but true to it’s chalkstream origins, it was pushing, but clear. The unweighted Hares Ear nymph of last week was still attached to my made up rod, as I entered my first pool, managing to roll a nice trout casting along the edge. Moving downstream mayfly were suddenly breaking free of the surface and it wasn’t long before the sound of rising trout could be heard. Upstream I saw a nice fish rise and retraced my steps to the pool, getting down on my knees to approach the high bank. As if by magic the floating nymph sank into a ripple and I was playing a hard fighting trout that rushed round the pool. I had already extended my landing net, which was waiting for the fight to finish. !8 inches of solid power, this overwintered stockie showed a few battle scars, but this river is fished from October on by coarse fishermen for chub, who complain about the trout getting in the way. 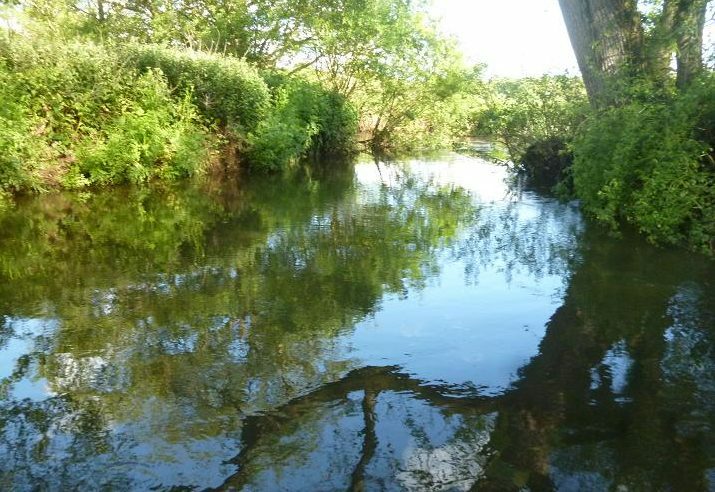 The mayfly were now coming thick and fast, encouraged by the warming sun on the river and the trout were mopping them up, seeing my next target rising under trees in fast water above a clump of roots. After a couple of sideways flicks of the line, the nymph dropped above it and vanished in a swirl. The shallows erupted with another good fish, that darted into the hole under the roots, then out again down into a run throwing up more spray. It was soon on it’s side in my net. Two good trout in ten minutes. There were rises everywhere and a few measured casts to a fish rising at the tail of a pool saw a wild brownie in the net. The wild trout in this river tend to be silvery on their flanks, this one of about ten inches was a welcome sight. Continuing downstream a large trout was rising like clockwork and I circled round away from the bank to come up behind it. It was not interested in my floating nymph, chasing mayfly as they tried to take off. 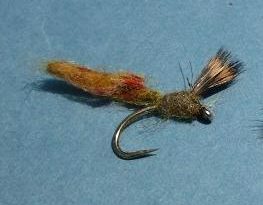 I tied on a tatty old Bodied Mayfly and cast it in with a plop. Gone. It went straight away. A zigzagging boil and the fish ran upstream, rolled and came off. Not to worry, I could hear more splashy rises behind me, seeing ripples spreading out among trees. Getting down behind a tree, the trout was just upstream of me and a short cast saw a vicious attack that hooked itself on the tight line. Boiling on the surface, the pound plus trout churned round in a circle and came off, my fly springing up into the tree. Using the landing net, I reached up and retrieved my old faithful mayfly. It had started raining and looking back upstream, the sky was black with falling rain. Fish were still rising and on my way back to the van was tempted to try again for the fish that I had rolled at the start. Splashy rises were still coming up along the brambles and the old fly did it’s work, hooking, not the stockie that I’d lost earlier, but another silvery wild trout, netting it as the heavens opened. Water on the lens blurred this pic, but it is good to see that the river is still capable of supporting these fish. With my top half soaked through, the van was waiting to give refuge from the storm, while I extracted myself from clinging chest waders. The session had lasted not much more than an hour. Must try to get out again before the mayfly finish. Rain at last. Rain at last. Like buses you pray for rain, then it all comes at once. That was the feeling this week as I waited for my Thursday to Saturday syndicate trout fishing days. Leaving home on Thursday afternoon in bright sunshine, I headed west toward an all encompassing black cloud, which by the time I reached the fishery, had begun dumping it’s contents over the countryside. I sat in the van and waited in vain for a break in the cloud. Unable to find a radio broadcast to my liking, I cut my loses and headed home to find that the clouds had passed us by, the lawns the burnt yellow of high summer. A commitment in another town, to collect a couple of pairs of scales ordered on behalf of my fishing club did not go well, with only one set available after an extensive search. Yet another set was ordered and with brightening skies, hoped to recoup what was left of the Friday afternoon, trying for a trout on the syndicate river. Lunch over and gear in the van, I headed back to the river, the window wipers on full for the last half mile, deciding that the car park at the lower end of the fishery would save fuel, if Thursday’s aborted attempt was to be repeated. I decided that I would fish whatever the weather and forced on my waders in the van, emerging fully kitted out into bright sunshine again, the warm southerly wind dispersing the clouds, as quickly as they had formed. Getting in the water above the bridge, the river looked perfect, with the occasional Mayfly blowing downstream, but my previously successful Black Devil failed to attract interest. Back over the bridge and into the meadow below, I followed the river down looking for rises, making blind casts to likely looking holding areas to no response. Mayfly were now skidding along the surface, driven by the downstream wind, before making their first awkward flights skyward, but the trout were not switched on to them yet. This pool on an S bend was as far as I was prepared to walk, the long wet grass of the meadow dragging at my waders. 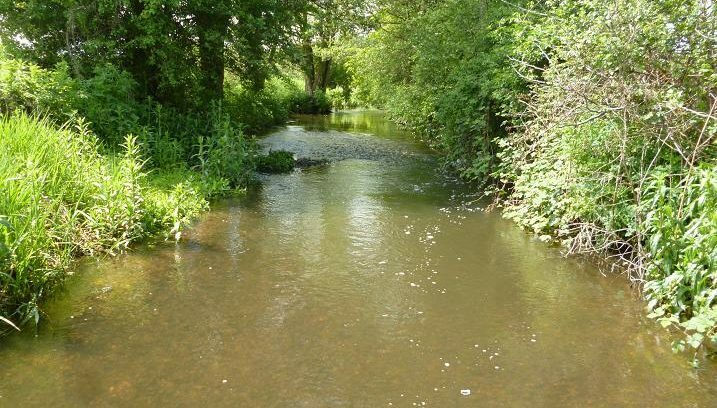 In past days, this time of year would see large trout, up from the depths, cruising around sucking in mayfly nymphs, but floods have washed away the gravel at it’s tail reducing the depth, while that gravel now lies in a fast shallow run only suitable for the tiniest of dace and juvenile trout. I worked the Black Devil nymph, up the pool without success and found myself distracted by a roe deer munching the fresh green leaves of an overhanging tree, taking out my camera in an attempt to get a closeup shot of this elegant animal. A step too far and the deer was gone in a series of dignified bounds, clearing a fence in Olympic style. Returning to my rod, I was studying the Mayfly as they broke the surface film, black head out first, with wings outstretched behind, then bing, they were clear, the gossamer wings springing up to catch the breeze like a sail, before that scudding take off. Masked by the ripple, a trout began rising silently on the outside of the bend close the bank. Mayfly were being taken with abandon above and below the surface and I edged upstream to get within casting range, aware that accuracy was impossible with the gusting wind. A dry fly would be dragged under with the combined force of the river and downstream wind, so the first option was the Black Devil, which was cast almost to the grass. A rise, and a missed strike by myself, or the trout, saw the nymph ignored from then on, while Mayfly continued to be plucked from safety. Option 2 was to tie on an unweighted Hares Ear Flashback nymph, which was rubbed in with floatant. The last 18 inches of leader was run through my lips to aid sinking, while the nymph would float in the surface tension like an emerging Mayfly. My first cast was too short, the second too far to the right, while the third dropped lightly close to the bank. A rise and I was in. A frantic, tumbling fight, gave way to a hard boring run into the depths of the pool, but this was not a big fish and a 10 inch wild brown trout was soon drifting back into my net. 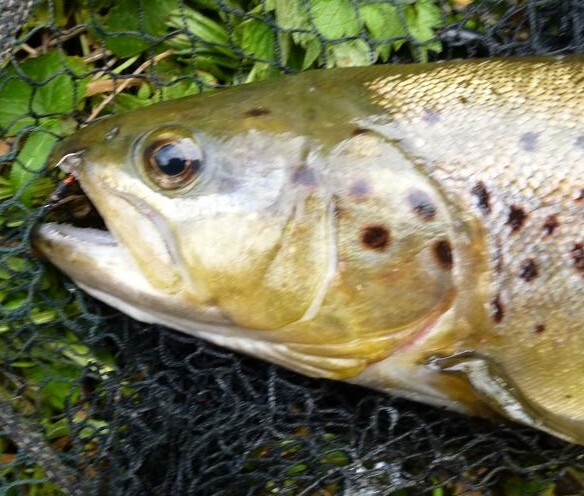 My first wild brown trout from the syndicate river this year, fighting fit and fat with a diet of Mayfly. It is still early days, but the season is already an improvement on this time last year. After letting the trout recover in my net before release, I made my way back to the van. I’d had a fish and dinner was waiting. 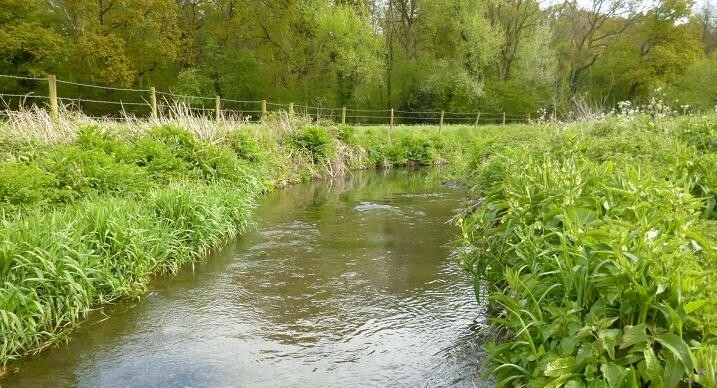 Following my success on the syndicate trout stream last week, I was keen to get back to fish, although a strong easterly wind and lack of water in the river dampened my enthusiasm. 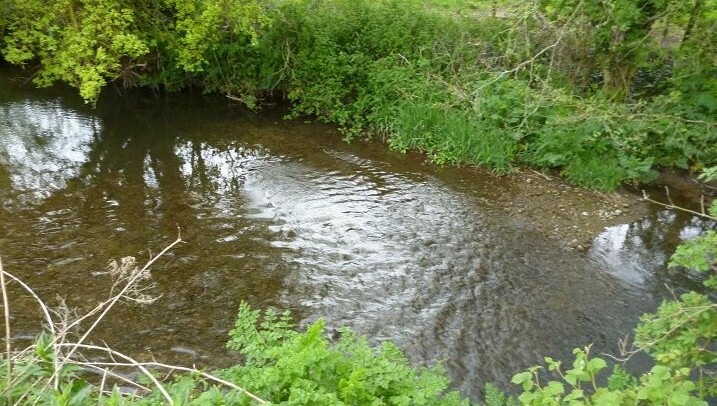 With no decent rainfall during April and none yet in May, this Hampshire chalk stream was now reduced to a series of pools connected by gravel runs of crystal clear water. 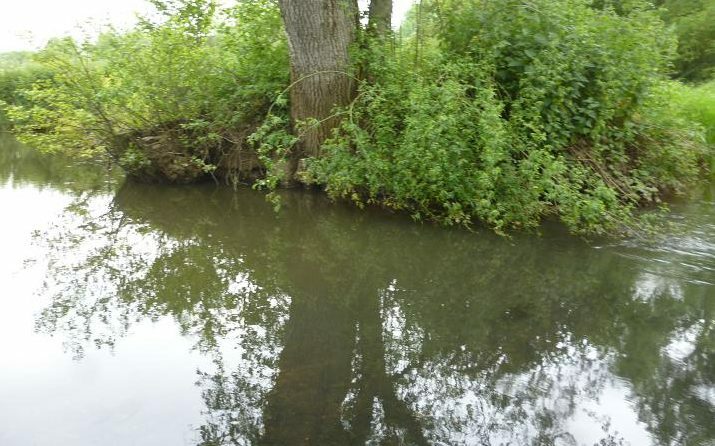 Fish were rising, but close to the banks under cover, where they were safe from herons and also angler’s flies. Several casts to a trout beneath this bush were unsuccessful and I sat for a while watching it top and tail for nymphs. More water and flow would have seen it prepared to break cover to chase it’s food downstream. Where the flow came off a gravel run I saw a small ripple, then a bubble, ahead of a patch of scum collected by the branches of an overhanging bush. This was a sign of a fish and I crept along the bank to within ten yards of the spot to make a cast. The wind was swirling, picking up the line and opted for an over cast onto the shallow run, watching the Black Devil sweep toward the patch of scum. Before it got there, the leader dived to the right and I was boiling a good trout to the surface. It turned and ran downstream, as I stripped line back to stay in contact, the brown running past me, bolting to the safety of the bush. “That’s lost it” I thought and turned to face away from the river putting on side strain, only for it to come out stirring up the mud. Once in the open it was a case of hoping that the size 14 hook would keep hold, while it was netted. This was beautifully coloured overwintered stockie 17 inches long with a massive tail, that tested my little 7 ft No4 weight rod to the maximum. The Black Devil nymph was just in the nose of the trout and could easily have twisted out. Holding the brownie upstream in the shallows with fresh water passing over it’s gills for five minutes, restored it’s strength and it swam across the gravel to disappear among the shadows. Walking downstream, bailiff Kevin was finishing off for the day, having caught another smaller stock fish, while his fellow bailiff Mick had found some wild fish that afternoon. With wild trout in mind, I continued down to where a long pool runs between tree roots to spill out over a gravel cattle drink. Keeping away from the bank, I circled round to enter the river on the shallows, slowly walking up the the pool. A good fish was rising above the tail, with another preoccupied further up between the trees. This was like old times, a hatch of olives was in progress and the fish in front of me was moving round the pool mopping them up. The wind had dropped and I considered tying on an emerger, but with the Black Devil still in place, why change a winning combination? Not wanting to disturb the pool, I stood in the shallows making casts to the right hand side, where the random rises were breaking the surface. With the nymph drifting back, I became aware of a shape slowly coming up toward it. The spots were visible, the leader gave a twitch and I struck into what briefly felt like an immovable log. A split second later, a broad back humped up in the water, the tail slapped the surface and it torpedoed off upstream stripping off line. The line jammed in the reel and I followed deep into the pool, rod bent double, convinced it would break me. My largest trout from this tiny river had been over 3 lb and this was bigger and stronger. It stayed on and I stripped line back, until it needed to run again, each time bring it closer, pulling it clear of the roots. My landing net was lying on the muddy shallows beside the pool behind me and I gave line to reach it. Suddenly the big stockie was wallowing on the gravel in front of me and I tried in vain to get my net under it, pushing the rod behind trying to drag it over the lip, while pushing the net with my left. Half way in, I lifted and the trout jumped out, leaving the hook in the net. It floundered in the shallows, as I tried the net again. Like a salmon it accelerated away back to the pool, then turned on it’s side swimming upstream, then faded back into the gloom. It was as knackered as I was! I stood there surrounded by a tangle of fly line and retrieved the nymph, which was chewed to bits, coming unwound. The other trout was still rising, but I’d had enough for one evening and whatever the size it would have been an anticlimax. Last year there were few rising fish to be seen, this can only be a good sign for the future. The last days of April sunshine had brought out terrestrial fly life when I made my second visit to the syndicate chalk stream. Passing through the roadside fishery gate, a large cobweb was crammed with small black flies and as I approached the river they were zooming about in the breeze. Having only made a very brief sighting visit before, I forced myself to ignore a rising fish in a position that required serious wading to manage a cast, intending to follow the river half way down the fishery before attempting a cast. More importantly, I had spent time the previous week applying a full tube of rubberised solution to my waders in an attempt to cure an untraceable leak and did not want to start the session with a squelchy boot. 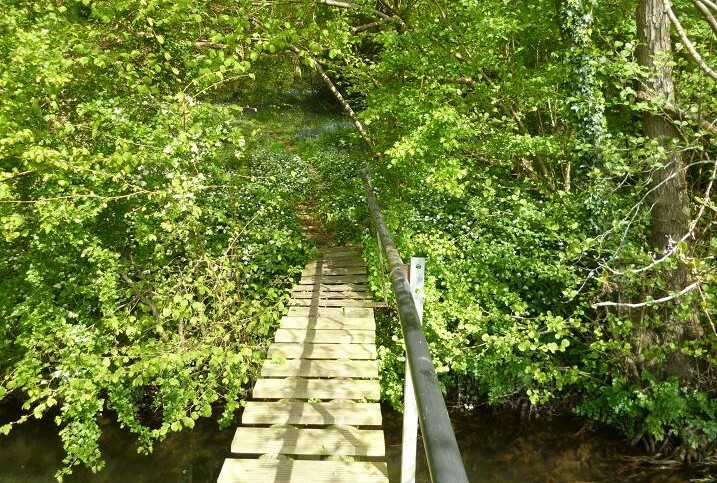 Crossing the bridge into the copse, the heady aroma of hawthorn, wild garlic and bluebells hit my senses as the sun warmed my back. All this and fishing too. What more could you ask for apart from maybe a trout in the net? I met bailiff Mick who had netted a wild brown, then just lost a much larger fish on a small klinkhammer. More rising fish, this was encouraging. Further down Kevin was mid river casting to another rising trout with a small Adams. Two bailiffs in one day, must be a good sign. Fancying the stretch upstream of Kevin, I asked if he minded me fishing 50 yards up and got the OK. 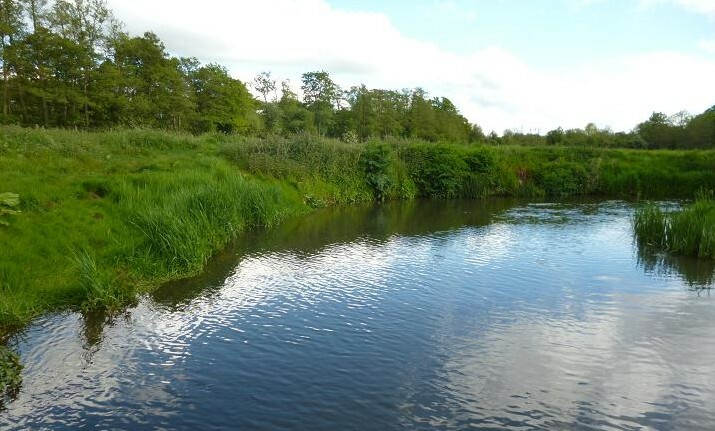 The river here carves out a deep channel as it rounds a bend creating a pool, where I have caught many trout in the past and the sight of small dimpling rises got my heart beating faster. 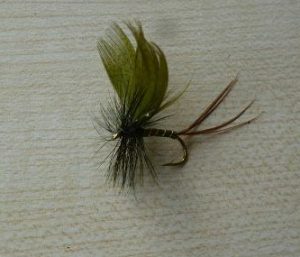 My Black Devil nymph was still on the line from my previous outing, but this works well with a greased leader fished just below the surface, so gave it a go. The strong downstream wind made casting from range difficult and I worked my way slowly towards the pool making false casts to the right to judge the distance. I waited for the rises to start again, but cast short, waiting for the line to exit the pool, before recasting. This time the nymph dropped on target, but after the fish had risen again. On the third cast the wind caught the line carrying it over to the right away from the rise, but as the nymph drifted back to me, the surface bulged and the line zipped under. The trout took me by surprise when I struck, being much bigger than the rises had indicated. The shallow pool erupted as the trout responded to the hook, two minutes of madness being followed by powerful surges, before I could reign the brownie back toward my net. A 16 inch stock fish, this brown had been harpooned by a heron in the clear shallow river, but showed no sign of weakness in it’s fighting ability. Kevin was passing by on the bank only minutes after I had left him. Triumphantly I pointed to the trout saying “The Black Devil strikes again!” Allowed time to recover, the brownie was soon swimming strongly back to the pool. Wading up to the next pool, a single rise gave away another fish at it’s head, but a high bank and overhead branches made for an almost impossible cast. Another rise, saw me adjusting my position in the river to avoid getting snagged, managing to place the nymph at the tail of the fast water, where it could drift into yet another rise. 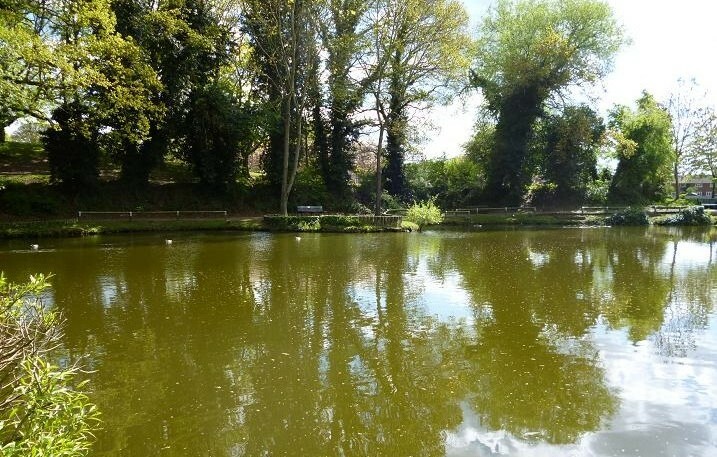 The leader sank away and I lifted into resistance, that told me it was not a trout, the initial surge petering out as a small chub came to the surface. With no more signs of fish, I continued my way back up river, only to see the clear stream turn murky and realised that the farmer had moved his cattle into the top field, seeing them already wading in the cattle drink stirring up the bottom. My main task now was to get past these energetic young bovines without getting trampled and once through the gate made my way back to the van. It had been a short, but sweet afternoon, rising fish, spring blossoms, sunshine and a good trout in the the net. Even better, my feet were dry. 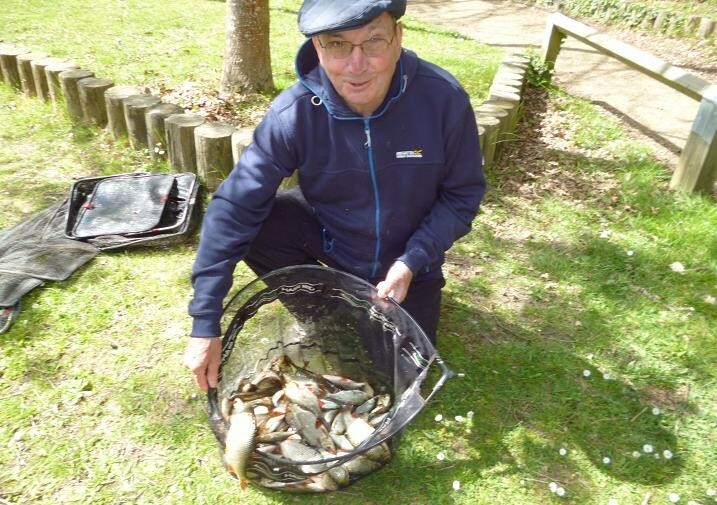 An invite to join friend John at Braybrooke Fishing Club’s Jean’s Pond, for an end of season roach and rudd catching session would not have happened, if we had believed the weather forecast. Strong north winds, driving sleet and thundery showers were promised by the TV weathermen, backed up by images of early morning snow falls in northern parts, but prepared for the worst we went anyway to be greeted by sunshine. In a dip, the north wind roared through the trees above us, passing overhead to leave the pond virtually untroubled, while we baked in the sunshine, only reminded of the forecast, when clouds passed over the sun to be replaced by an icy blast. While John settled into peg 11, where he had netted 16 lb of roach and rudd on the waggler with maggot a fortnight before, I chose to set up in the unknown peg 10 to his left, which is set back in a bay. 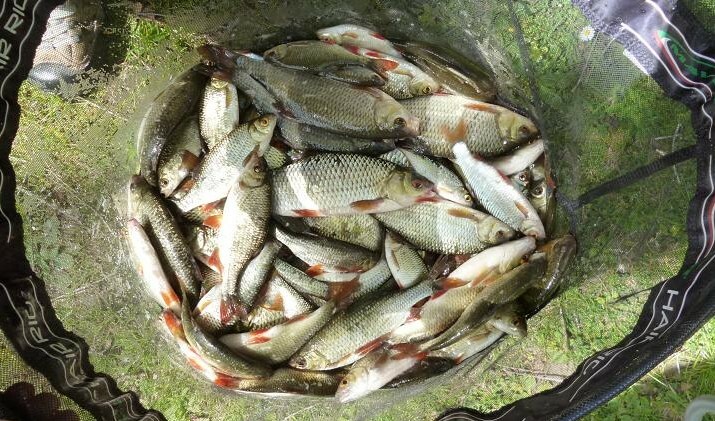 Having plumbed the depth and found it shallow out to 8 metres, I considered moving to the deeper pegs to John’s right, but decided to learn what I could for the future, while he wanted to top his previous best weight from 11. John started off with his 8 metre elasticated whip and long line, waggler combination, fished out over flouro maggots, while I as usual was set up for the pole and bread punch, feeding a couple of egg sized balls of liquidised bread out to the drop off in my swim. Both of us were into roach from the start, the punch out pacing the maggot in quantity and quality. Always competitive, John was getting worried that I was ahead, as I was netting all fish over 2 oz, due to them being lightly hooked and dropping off, when swung in, much to his amusement. I was experimenting with a much lighter elastic, which on the canal with size 20 hooks, set the hook easily, but now a larger size 16 was barely hanging onto the skin of the lip. My spare pole top with heavier elastic was in the van. I adjusted to the lighter elastic, which gave security, once the better sized rudd moved in over the feed. A pike took one of my roach as I was bringing it in. 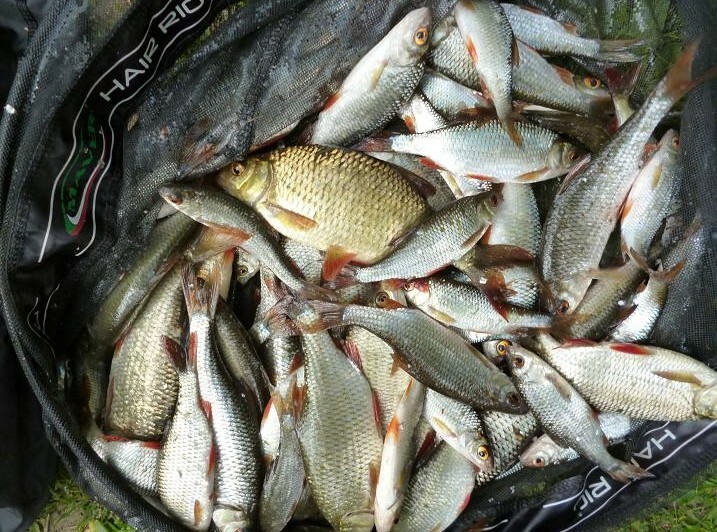 The swim went dead apart from tiny roach, which I threw back, not wanting to damage them in the net. Shortly after this John chuckled “Look at this clonker Kenny!” as he brought a 12 oz roach to his net. I responded with another small “clinker” roach as John swung in another “clonker”. His weight was beginning to outstrip mine, as I watched the pike flash over into yet another roach. This was a relatively small pike of about 3 lb, but it had a taste for larger fish, coming up to the surface to snap at the tail of a good rudd, just as I was about to net it. Finding deeper water closer in to my right, I decided to leave the pike to it’s slaughter and build a new swim and began to catch small roach, while John continued to swing in clonker roach and rudd, until the pike moved into his swim, chasing fish to the surface. He countered this by feeding further out to fish the waggler on rod and line, although these were smaller fish. We had both been busy catching for over two hours, when we stopped fishing for a lunch break, while we guessed what weight we had. I had been counting my fish in and had over 60, while John had far fewer, but better average size. From my vantage point behind him, I could see all his landed fish, while he could only see mine from the corner of his eye. My fish were brought back with the pole tip sunk, letting the elastic do the work, breaking down to 3 metres of pole to net the fish at the last moment. He was convinced that I was ahead on weight, but I knew better. The pike had seen to that. With an hour to go we started again, he going back to the whip, while I put another couple of balls into my original swim. 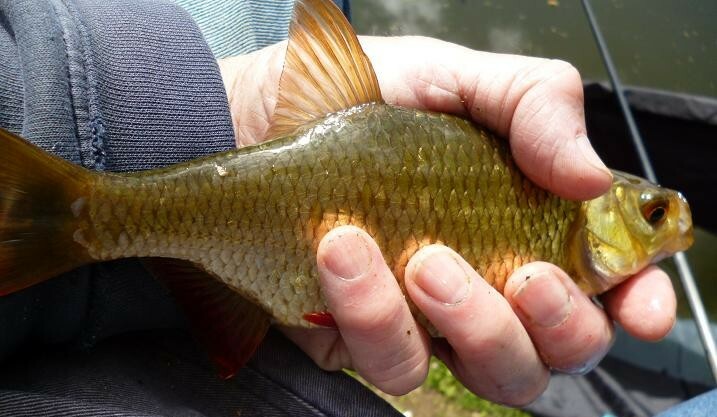 The roach and rudd were coming steadily to both of us, one of mine spewing maggots, which proves how much these fish move about, as I hadn’t any to put into my swim. Bang on 2 pm we stopped fishing, John had been catching some real clonkers, while most of mine had been smaller clinkers but twice as many. I estimated I’d had two and a half pounds in that last hour, while John guessed he’d had four pounds. 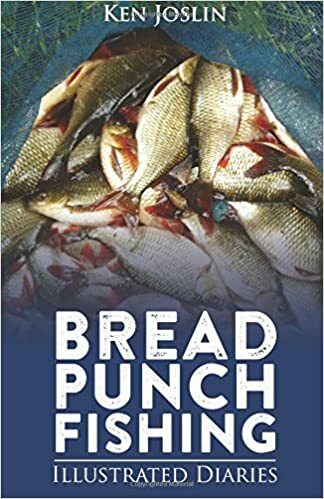 I weighed my net in first, which topped 8 lbs, a good weight for the bread punch in four hours fishing. John then pulled out his net, the two of us tipping them into the weigh net, seeing the scales swing round to 12 lb. John had hoped for more from this swim, but he was happy to have beaten me into second place again, the wag and mag beating the punch on this occasion. As we packed up, we watched a 3 ft long pike cruise through John’s swim on the surface. Now that was a pike!